Ive owned my TaoTao scooter for a little over 2 months and have almost 2500 miles on it and it runs strong! What's funny is I also own a Kymco Super 8 50cc and while it looks amazing and rides like a Cadillac, it goes so slow & is so underpowered it's more of a hazard on the road! My TaoTao did require maintenance after buying it (CDI module for $17) but after fixing this part it ran great! The par was a 1/5 of the cost of a CDI for a Honda, Kymco, etc., and very easy to come by on the internet. I have my two scooters that are my only form of transportation at this time, I bought my TaoTao new w/7 miles on it, and my Kymco Super 8 50 (Prior Indy 500 pitcrew bike) w/400 miles on it and now over 2 months later the the TaoTao again has 2500 miles and climbing, while the Kymco Super 8 has 700. If you bought it through an online seller all they will do is give you free replacement parts for the warranty period. Any labor charges will be paid by the buyer. There are many Brick and Mortar establishments selling Tao Tao. The warranties they offer might cover Labor. CDI stands for Capacitive Discharge Ignition. The CDI module is like a big condenser between the alternator and the ignition coil, It stores energy until it receives a signal and then sends out an intense current to the ignition coil. In olden days the current to the spark plug was something like 20,000 volts over a long duration. CDI is up near 80,000 volts over a very short burst increasing the strength of the spark at the plug. They fail occasionally and are cheap (like $15) to replace. i NOTICED ON OWNER HAD TO REPLACE THE CDI MODULE AFTER HE PURCHASED IT. WHAT IS THIS MODULE AND HOW WILL IT AFFECT THE CYCLE. ALSO, DOES TAO TAO GIVE ANY KIND OF WARRANTY ON THEIR CYCLES? It could be something as simple as the kill switch being in the "Off" position or something more. There are numerous scooter forums where you can get help. All these forums have numerous people with ideas and experience that can help you. In a place like this you may wait days for assistance where on a forum the answer may come in minutes. My scooters a 2008 50cc Chinese made scooter and I love it! I've invested tons of cash worth of upgrades (high performance/racing parts). Did it need them NO but I am a techy and wanted it to be the best it could be. I bought it for $600 it had 200 miles on it. It now has 854 miles and it runs VERY strong and GREAT! Actually I couldn't ask for better. I've invested counting original purchase about $3000+. But now it goes well over 60mph+. I renewed every engine part possible to better its performance but it wasn't a cheap task. But I can assure you all it was a worthy venture. Don't make the mistake the gentleman below did. There are numerous reputable sellers online. It would seem that the number of dishonest ones are dwindling. I bought my scooter six and a half years ago from GS Motorworks and it still runs just fine. They became the distributor when Tao Tao bought them because of their incredible reputation for importing quality scooters. Now Tao Taos are imported with quality components no matter who you buy from. 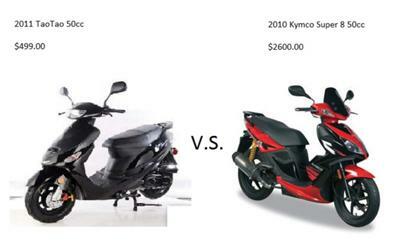 Imagine someone using a Tao Tao over a Kymco. I think that about says it all. THE WORST PEOPLE ON THE PLANET. THAN YOU DEAL WITH OTHER STAFF AND THEY HAVENT A CLE AS TO WHAT THEY SELL. THAN I FIND OUT THIS MODEL IS 6 YEARS OLD AND WAS SOLD NEW???? The TOMOS Nitro 50 is a super choice. (TOMOS is also importing the TaoTao calling it the MAGIC). The Nitro 50 is made in a factory in China owned by SYM. SYM is a Taiwant manufacturer of very high quality bikes. The bike is beautifully made. The quality and workmanship are very good. One thing about most Chinese bikes is that the rear suspension is cheap and you get tossed around a lot. Also the center of grabity is quite high. If you MUST purchase a TaoTao, buy the Magic. One thing TOMOS does do is honor their warranty and keep a huge parts inventory. Their dealer network is also pretty good. I purchased 2 taotao atm-50a1 scooters from http://www.familygokarts.com/ and the scooters and the dealer are great. First one is 2012 second one 2013. First change motor to oil castrol 10/30 non synthetic and rear gear oil with gl5 80/90 non synthetic after first tank of fuel change again. Change spark plug to a ngk. Junk the factory carb and search ebay for 50cc gy6 with upgraded jets as they are shipped over here running way lean. Also these little 50cc engines love 93 octane fuel. The best results I have is premium 93 from a local shell station. We were easy on them for the first tank of gas breaking the engine in and we dont abuse them now but they are seeing the miles. They are holding up great no complaints. I am getting a 50CC ToaTao delivered in few days. Do I have to change the oil right away? Also- What oil should I use? Thanks. I have a 2011 taotao 50cc and i love it have owened 2 other scooters and they were junk they were eton beamer and a motofino my choice is my taotao ive already got over 5000km on it and just replaced my drivebelt drivebearings and put a 70cc kit on it i have around 1000$ in mine total and it will do 55mph with no problem any sugestions on how to boost it up a lil more without breaking the bank? I have a 2012 TaoTao with only about 500miles on it so far (VIP Future Champion, 49.5cc) and I've ridden the living hell out of it (like full throttle, in excessive heat, etc). I did break the back rack off doing a wheelie (I'll get a new one; no biggie) but all the maintenance I've done was to change the oil to Castrol syntec 10 30 and adjust the air/fuel ratio screw a quarter turn out. I'm not pleased with the top speed of 35mph but it is a 50cc so what are you gonna do? I do plan on getting some 4g rollers and maybe a couple of other tune-up items (like a new NGK spark plug) but I'm 240lbs at 6'5 so with as hard as I've been riding it, I'm frankly surprised I haven't broken it already. I bought it on July 4th so I've put all those miles on in only two weeks. I bought it brand new with 2km on it. I bought a Tao Tao scoot brand new from a flea market last year ive put 5000 kilometers on it and have done a ton of work to it first and foremost trash the stock Carb its garbage no matter how you try and look at it next replace the engine oil the oil that comes in it is for transport only not for road use after that its ready for the road but its going to be slow like other 50cc's laughing at you slow replace the variator(front clutch) and the back clutch and get an upgraded torque spring. Next replace the cdi,ignition coil and spark plug with upgraded parts, at this point your stock air box is going to have to go to make way for a performance one, at this point you will be going slightly faster than most scoots and leave everyone in the dust when your going down hills. There are plenty of other things that you can do but this is a good start I get all my parts from scrappy dog scooters btw this is much cheaper than buying a Honda or Yamaha plus its fun and you become an expert on scooters with out much effort. I have had a taotao 50 for since November of 2011, I purchased it used on CL and the first owner purchased it in April of 2011. These are great bikes with some new roller weights they will be out running any other 50. That being said they do require routine maintenance. You need to change the motor oil every 1000 Km and the gear oil every 3000km. If you do it yourself and look at the offset of the gas your buying this is still a economical choice. That being said if you ride the crap out of it you are going to need more maintenance I would highly suggested a larger engine for anyone trying to cover distance. Running at full throttle all the time increases maintenance. I have around 4000 mile, 10000k, and it is just over a year old. All around a good scooter if you take care of it. i bought scooter last july,its not even a year old and its a stick in the mud........it wont even start or use the kick start.i bought it at a pawn shop in ind.ithought it was nice,it ran good up til now.the ele.starter is out plus i think the piston is shot,oil is good i just change it about a month ago.i wouldnt buy another one if my life depends on it.my buddy bouhgt one in 2010 an the ele.went out,he had to put a toggle swicth on it,and til this day it dont run,so if anybody reads this take warning and do ur homework befor u buy one, cause i didnt. Where did you get the taotao from that cheap? I'm looking at one and it costs 620.